America's largest interactive murder mystery comedy dinner show. Solve a hilarious murder case while you feast on a fantastic four-course plated dinner. Just beware. The killer is hiding somewhere in the room, and you may find yourself as a Prime Suspect. 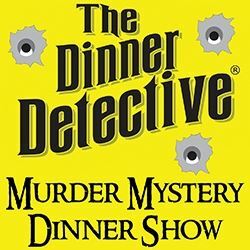 The Dinner Detective Murder Mystery Dinner Show performs on Saturday nights. We also offer private shows that are customized to your group with roles for your group members to play. Join us for a one-of-a-kind public or private event that your guests will talk about for months. Our show is very different from traditional murder mystery dinner shows. We will hide non-costumed actors in the audience that are pretending to be regular guests. This results in a much more social and interactive evening than with other shows; you will find yourself engaged and involved to a level you never thought possible. Our shows are set during the present day and take place in real time. Over the course of the night, our costumed Detectives will uncover clues, interrogate audience members that may or may not be part of the show, and help everyone get closer to solving the mystery. The audience member that gives the best correct answer of "whodunit?" before the killer is revealed will walk away with a stellar Prize Package. Your ticket includes our signature murder mystery show with a Prize Package for the Top Sleuth of the night, as well as a fantastic dinner with individual choice of entree and waitstaff gratuity included.